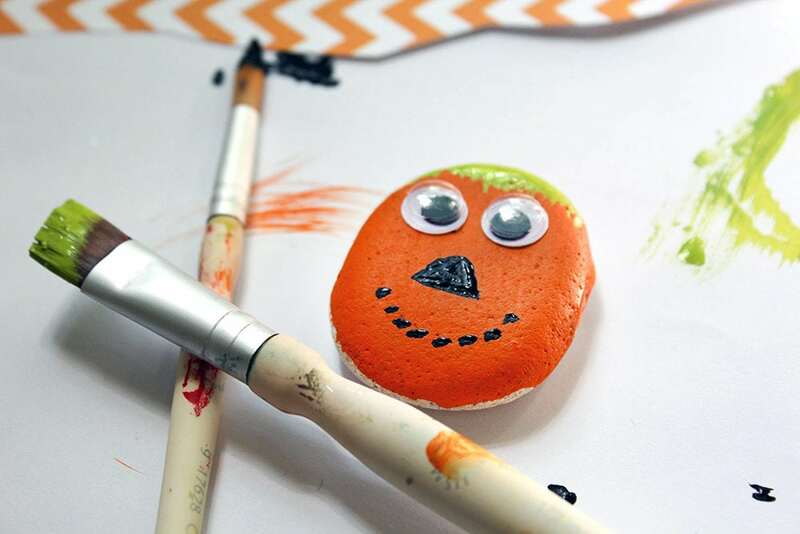 Hand painted rocks are a fun project for the family to do together. 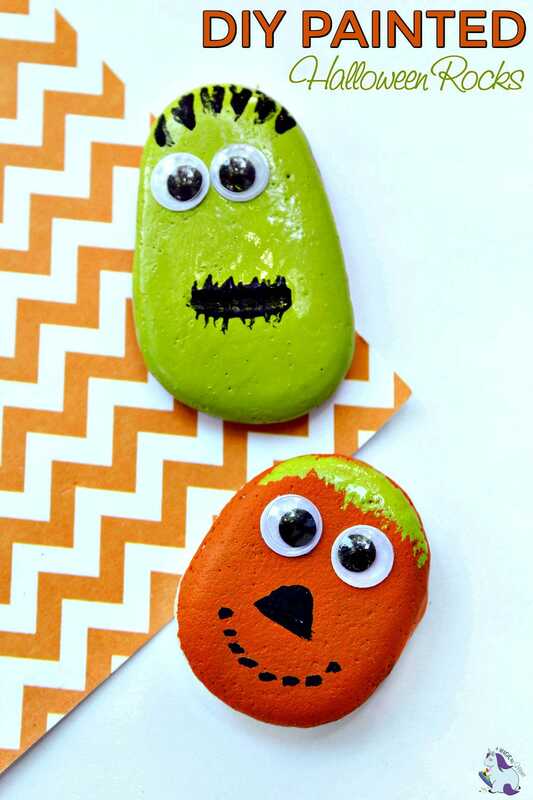 Decorate stones for a Halloween treat. I read a few articles about people leaving painted stones around their towns. It’s a way to spread happiness and promote random acts of kindness. Anyone who finds the unique rock crafts has their day instantly brightened. Of course, only do this with adult supervision. Here’s an easy project that takes just a few supplies and minimal skills. It’s perfect for novice crafters or those of us who feel like we might lack DIY genes altogether. 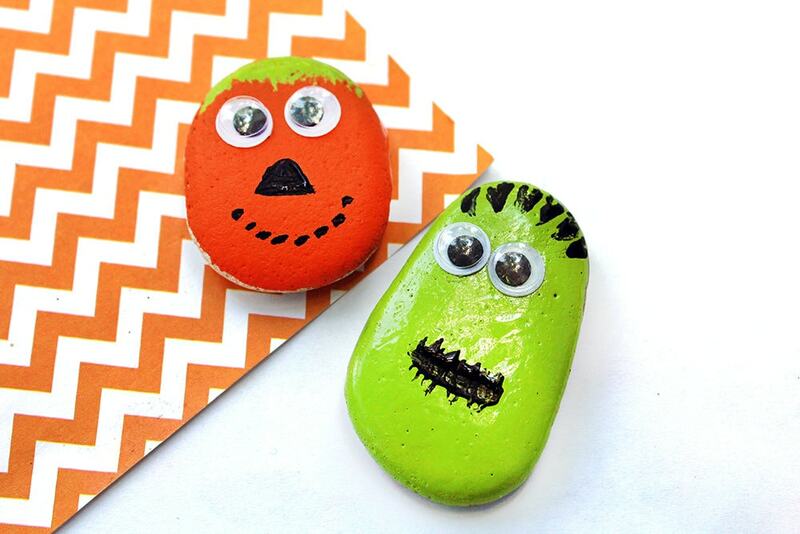 Below is how to a make a Frankenstein and pumpkin rock. Finding the perfect rocks to use can be an adventure in itself. Take the whole family on a hike to wherever you think you can find flat, smooth stones. Apply two coats of paint to the rocks. For Frankenstein, apply two coats of green and for the pumpkin apply two coats of orange. Allow the paint to dry thoroughly. Once the paint is dry, apply the eyes to the rocks. Add a dot of glue to the back of the googly eyes and press into place. 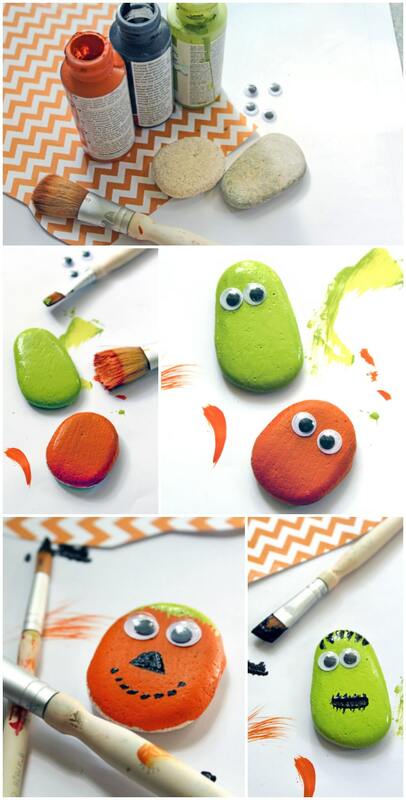 Glue the eyes towards the top half of the stones, so you have room for the rest of the facial features. Next, add the embellishments to the rock faces. Decorate the pumpkin with a simple polka dot mouth and triangle nose. Give him some green hair towards the top. For Frankenstein, draw a stitched mouth and spiky hair with black paint. Feel free to get as creative as you wish while applying facial features. Allow all the craft paint to dry. A warm window sill is a perfect place to put them. 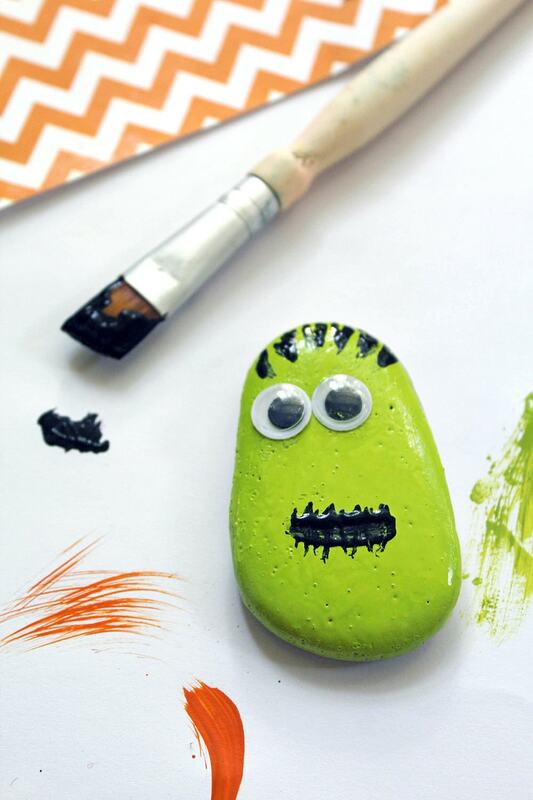 Once the Halloween hand painted rocks are dry, enjoy them however you want. Use them as Halloween decorations, share with family and friends, surprise neighbors with your creations, or let the kids play with them. Maybe start a kindness project in your own neighborhood. Check local Facebook groups to see if anyone is aware of the idea of leaving fun craft projects around for others to find. Ideas like this tend to spread quickly. We can all use more happiness in our areas, so as long as it’s done safely and responsibly, it’s a good idea. What kinds of hand painted rocks would you like to create? I love the idea of using these for random acts of kindness. So simple, yet so fun! What a fun project to do with kids! I like this idea. I have seen a few other hand painted rocks. This is a very creative idea. I always loved pet rocks. These totally elevate that.